We offer many ways for students to learn about agronomy and sustainable crop production methods. Scientists at the Malheur Station specialize in research important to row crops, small grains, and alfalfa. Researchers are actively involved in answering production questions related to smaller acreage crops like potatoes and peppermint, and the evaluation and development of potential new crops. Willamette Valley Field Crops Extension provides research-based information for commercial cereal grain, grass seed, legume seed and oil crop producers. The knowledge a grower needs for growing wheat, barley, canola, and other cereals in the dryland farming region of the PNW. 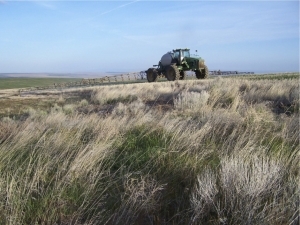 The Columbia Basin Agricultural Research Center, with facilities in Pendleton and Moro, is a branch of the Oregon Agricultural Experiment Station at OSU's College of Agricultural Sciences. The Oregon Department of Agriculture has assembled a committee of policy officials and agriculture experts, including Russ Karow, head of the OSU crop and soil science program. An Oregon State University wheat expert hopes to help farmers make the best choices as they select which varieties to plant next. With harvest starting, wheat farmer Jim Williams has more questions than answers. Stripe rust is spreading quickly on susceptible wheat varieties in Oregon State University test plots, extension cereal specialist Mike Flowers says.